Most people are familiar with the moniker of Mr. Ten Percent bestowed on Pakistani President Asif Ali Zardari. Now meet Mr. Thirty Percent, Ausaf Umar Siddiqui, a Pakistani-American in Silicon Valley, who is accused of receiving illegal kickbacks of up to 31 percent from vendors of Fry's Electronics. According to San Jose Mercury News, Siddiqui, the son of a Pakistani diplomat, was a computer salesman who rose through the ranks to help build Fry's Electronics into a giant retailer over the last twenty years. He is now facing allegations that he defrauded the San Jose company out of $65 million, much of which he used to pay off enormous gambling debts in Las Vegas. Fry's Electronics is a specialty retailer of software, consumer electronics, computer hardware and household appliances with a chain of superstores headquartered in Silicon Valley. Starting with one store located in Sunnyvale, California, USA, the chain now boasts sales of $2.4B with 34 stores located in several Western states, two near Atlanta, Georgia, multiple locations in Texas, and one each in Illinois and Indiana. Often described as geek central, Fry's stores employ a large number of South Asians and other immigrants in various capacities throughout their stores in Silicon Valley, CA. Siddiqui, who goes by "Omar" and was Fry's vice president of merchandising and operations, appeared in federal court in December, where prosecutors filed a complaint alleging he masterminded a "secret kickback scheme to defraud Fry's Electronics of millions of dollars." Siddiqui persuaded Fry's that the company should eliminate sales representatives on his accounts, and instead, he would act as a middleman between vendors and Fry's. He promised that he would save the company a lot of money that way. But instead, the complaint alleges, he ended up charging exorbitant commissions — up to 31 percent, or ten times the usual amount — to the vendors, which he funneled to his own straw company, PC International, according to San Jose Mercury News. A 42-year-old bachelor, Siddiqui has expensive tastes and a serious gambling problem. He was known around the office for driving fast cars, carrying wads of $100 bills in his pocket and boisterously rooting during sports events he watched on the four TV screens in his office. He spent $162 million in three years at the MGM Grand Casino and Las Vegas Sands Casino, according to his bank statements detailed in the complaint written by IRS Agent Andres Gonzalez. Siddiqui owns a luxury condo in Palo Alto, a Mercedes and a Ferrari, and he used to fly into Las Vegas frequently on Fry's corporate jet. He had a long list of demands for the hotel staff (who called him Mr. S) during his frequent visits to Las Vegas hotel casinos. He demanded Aramis cologne and badger hair shaving brush. Lint-free towels. Dom Perignon Rose champagne and Kurosawa Sake in the fridge. And never, under any circumstances, approach him from behind. If the hotel staff didn't want to face Mr. S's wrath, maids knew to arrange bowls of Glitterati Mentissimo peppermints adorned with a single rose throughout his suite, and to stock his shower with Nioxin shampoo for "fine and thinning hair." White vases were a no-no — he considered them bad luck. There's a saying in America: Nothing is certain but death and taxes. No one can fool the Grim Reaper and the Tax Man. Like others before him, Siddiqui seems to have been nailed by the IRS, America's feared tax collectors who were tipped off by one of Siddiqui's colleagues at Fry's. Allegations against Omar Siddiqui have been getting a lot of local media attention in Silicon Valley, California, since his arrest in San Jose a day after Christmas. However, with the exception of a few isolated instances of immigration and terrorism charges after 911, the news of Pakistani-Americans getting in trouble with the law is rare. There have been a few instances of white-collar crime involving alleged violations of the SEC rules. The vast majority of the estimated 500,000 Pakistanis in the United States are legal immigrants with about a half of them with citizenship status. Highly educated with many in professions such as medicine and engineering, Pakistani-Americans are a very affluent ethnic group whose median household income is 62% higher than the national average. No No No... No Pakistani will do such things. It must be the CIA-RAW-Mossad evil axis trying to defame Pakistan! Riaz - Hopefully this post makes Jadev, Ray, and many of those anonymous writers happy that you are a free writer indeed. Thanks for the post and facts. And you made good reference to Mr. 10%. At least Mr. 30% turned an ordinary shop to a $3B business, whereas Mr. 10% is busy sucking the last drop of blood from the nation...no wonder its called the 'God Gifted State'. That was an awesome story Mr Haq,I enjoyed this post what a con-artist.I respect USA, its really a conservative country, as contrary these things would have been perfectly fine and ethically ok in India and Pakistan really.Kind of a norm in Mumbai, Karachi, Dacca, Colombo, Dubai,buisness communities etc etc. There's a saying in America: Nothing is certain but death and taxes. No one can fool the Grim Reaper and the Tax Man. Like others before him, Mr. S got nailed by the IRS, America's feared tax collector. I don't know if you have heard of Al Capone. He was a Chicago gangster who was able to stay out of jail until the IRS got hold of him for not paying taxes on his income from extortion and selling moonshine. His accountant gave him away. He spent the rest of his life in jail. Well well well. it is really nice to know that commission and kickbacks can be used in something good to. Look at the company it rose from ashes to become one of the giants in US. It was heartening to see that although he used all his money on wrong things at least he enjoyed it to the fullest. Not like many of us who take it to their graves. 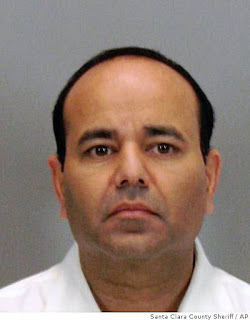 A plea agreement unsealed this week in the case of Ausaf "Omar" Siddiqui shows the Palo Alto resident, once a vice president at Fry's, pleaded guilty to one count of wire fraud and one count of money laundering. He is expected to be sentenced before U.S. District Court Judge Jeremy Fogel on Dec. 8. In exchange for the plea and agreeing to cooperate in any further government investigations, federal prosecutors dropped seven other felony charges against Siddiqui that were contained in the original indictment that accused him of wire fraud and money laundering totaling $6 million. As part of the agreement, which had been under seal since February, Siddiqui admitted that from 2004 to November 2008, he set up a scheme to defraud Fry's "in order to induce Fry's vendors to pay money to me and not Fry's." He admitted to setting up sham companies for vendors to pay kickbacks to him, and said that vendors had secret agreements to pay him kickbacks to do business with Fry's, the agreement states. Siddiqui admitted that on numerous occasions, vendors sometimes gave "loans" "amounting to millions of dollars" to his sham companies, the agreement states. vendors by at least the amount of the kickbacks paid to me" and the sham companies, the agreement states. Fry's has repeatedly claimed no knowledge of this scheme, denied customers were ever affected negatively and fired Siddiqui shortly after his December 2008 arrest by IRS agents. Tuesday, Fry's spokesman Manuel Valerio was not immediately available for comment. In addition to possibly receiving a maximum of six years in prison, Siddiqui also agreed to pay $65 million in restitution; he's allowed to subtract out what the government has already taken from him, including about $54,000 in bank accounts, $30,000 in cash, a 2006 Mercedes and a 2002 Ferrari. It's unclear how he'll pay the restitution in light of his July bankruptcy filing listing $137 million in debt -- much of that owed to casinos around the world. He was once a prized "whale" in Vegas, a high roller who demanded that casino butlers and bellboys call him "Mr. S" and fill his room with golden raisins, bottles of Dom Pérignon and Glitterati Mentissimo peppermints adorned with a single rose. Siddiqui also faces several civil lawsuits from vendors, totaling at least $10 million. The lawsuits name both Siddiqui and Fry's as co-defendants, arguing that the company was aware of what Siddiqui was doing. Fry's has denied any wrongdoing. Much about this case has been kept private and some of it has been under seal. Siddiqui himself has refused to speak to this newspaper, as have his defense attorney, Paul Meltzer, and assistant U.S. attorney Thomas Moore. Siddiqui's agreement in February was sealed for unknown reasons, and in a surprising turn, Moore's office requested that the judge unseal the deal in late August, which the judge did Friday. With "almond-shaped eyes," "flawless skin" and ''full beautiful lips," Saman Hasnain easily took first place in the 2008 Mrs. Pakistan World beauty pageant, according to the group's president. But the same physical assets that snared Hasnain that top title also helped her lure South Bay homeowners into a loan modification scam she and her husband Jawad operated from 2008 through October 2010, prosecutor Victor Chen contends. "She was really pretty," said Korina Diaz, a Gilroy waitress who lost her ranch after paying the couple $11,500 to lower her mortgage payments. "She wore a skirt suit, high heels, nylons -- like a real good-looking professional lady." Saman's striking appearance was crucial, Chen said, because the couple didn't know their victims and had to make a good first impression. They attracted homeowners by word-of-mouth and through fliers passed out at ethnic supermarkets after the housing market tanked, according to Chen. Now the Santa Clara County deputy district attorney has charged them with ripping off 17 people -- just a fraction of the 80-100 families he says they defrauded. The Hasnains each face 19 felony counts of conspiracy to commit grand theft in the loan-modification scheme, and Jawad also has been charged with nine additional counts of felony grand theft for allegedly enticing victims from 2006 through July 2010 into investing in a fraudulent 10-unit condominium development in Fremont. However, there is one big problem: Earlier this month, the couple fled with their two young sons to Lahore, Pakistan -- a country that has no extradition arrangement with the U.S.
Jawad faces a maximum of 19 years and four months in prison, and Saman at least four years. But it is rare for white-collar criminals to serve that much time; often, they serve far less, especially if they pay their victims back. Diaz, 38, said she and her husband were not behind in their payments when she picked up one of the couple's loan-modification fliers at a Mexican supermarket in Gilroy. But they were worried that her husband's concrete business would drop off after the housing crash, making it difficult for them to keep up with the $6,000 a month mortgage on their 2.5 acre, $1 million ranch. Diaz said after she paid the Hasnains the $11,500, the couple advised her to stop making the mortgage payments, otherwise the bank wouldn't have an incentive to renegotiate the terms of the loan. Diaz was so impressed by the couple that she invited about 30 friends to her house to listen to their pitch. About 20 also forked over thousands, she said, and most lost their homes. Diaz didn't figure out she had been bilked for about 10 months -- too late to stop a Florida bank from taking their home. Now, she and her husband and three kids live in a cramped apartment. Her advice to others to avoid being duped? "Not to believe anybody," she said, "who comes knocking on your door, even if they look nice." A 24-year-old Fremont man was arrested Wednesday in connection with a phone scam targeting elderly residents across the country, Santa Clara police said today. Police in Richland, Montana, contacted Santa Clara police on Wednesday to tell them a 77-year-old man had been instructed to send $20,000 in bail money for his grandson to a Santa Clara address. Officers set up surveillance at the pickup location and saw Vamshidhar Reddy Kotla arrive and retrieve the package at 6:04 a.m., police said. Kotla was detained and later arrested. Police identified four other victims during their investigation and retrieved $28,000 in cash from the suspect's home. Kotla is believed to be a member of a group which targets and runs scams on elderly residents. Police said residents should be wary of calls demanding money over the phone and call police at (408) 615-4700 when in doubt. A former Tesla employee from India has been charged by US federal prosecutors for allegedly embezzling $9.3 million (Rs67 crore) from the company, a statement from the US department of justice (DoJ) shows. The accused, Salil Parulekar, 32, was a group manager for global supply management and industrialisation at the electric-car maker’s Palo Alto headquarters till December last year. On Nov. 08, a grand jury indicted him on charges that he fraudulently diverted payments from an existing supplier of the company to a former one. The indictment contends that Parulekar did so “by falsifying invoices; creating fraudulent accounts payable documents, such as bank account information and wire instructions; and impersonating Hota employees.” He allegedly stole the identity of a Hota employee to deceive Tesla’s accounts division into switching the bank account information of Hota and SHW. SHW declined to comment to queries from Quartz, and an email sent to Tesla did not elicit any response. The probe was conducted by the Federal Bureau of Investigation (FBI). The US attorney has charged Parulekar with nine counts of wire fraud (legal speak for financial fraud involving telecommunications) and one count of aggravated identity theft. If convicted, he can be awarded a maximum sentence of 20 years, along with a fine of $2.5 million, under US law. Parulekar left India in 2008 to pursue a masters in industrial engineering from North Carolina State University. He is a graduate of Mumbai’s KJ Somaiya College of Engineering. He joined Tesla in 2013, and became a group manager in October last year.